Welcome to the skills assessment. You should take this assessment after you have viewed the In-Service Video or after you have attended a webinar or a live In-Service. 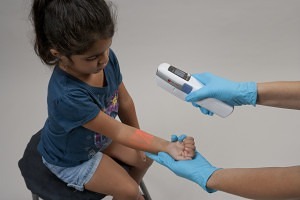 This short quiz covers the key things you need to know about operating the AV400, using Vein Illumination in patient care, and the care and cleaning of the device. After you pass the quiz, you’ll be presented with a printable and downloadable certificate for your records. Congratulations, you have successfully completed the Vein Illumination Skills Assessment. Remember, all of the information contained in the quiz can be found in the user manual and AV400 training video. The AV400 should be held at what distance from the patient? 1 to 2 inches (2.5 to 5 cm). 11 to 15 inches (28 to x 38 cm). 4 to 18 inches (10 to 45 cm). 3 to 5 inches (8 to 13 cm). 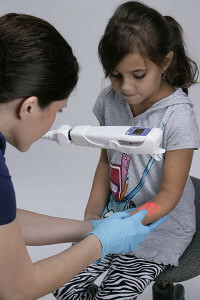 The AV400 can be held anywhere from 4 to 18 inches (10 to 45 cm) from the body of the patient. Most clinicians prefer a distance of around 8 to 10 inches (20 to 25 cm) which provides a good balance of brightness and projection size. As you get closer, the projection gets brighter and smaller. As you move away, the projection gets larger and less bright. Pick a distance that suits the patient and room lighting. Only perpendicular to the vein direction. Only along the vein direction. Rotated at any angle to the vein direction. The AV400 can be held in whatever orientation is convenient for you. This will vary based on your position and the patient’s position. You may change orientations between handheld assessment and placement in a hands-free stand. Regardless of what angle you hold the device relative to the vein direction, always remember to hold the unit directly over the veins you are studying. What button do you press to turn on the AV400 and view veins? The blue button on the side. The middle button on the top. The button on the side will turn the vein projection light on. The left button on the top switches between normal projection and inverse projection. The round button on the top turns the unit off. 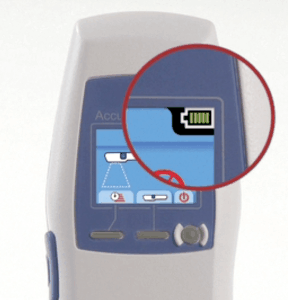 While not used during clinical procedures, the center button can be used to display the device’s serial number when the unit is on, but not projecting. Pressing the top round button will turn the unit on an off, but not the vein projector. Always use the blue button to turn on the projection. statements about the inverse setting are true. May improve visibility outdoors or in bright surroundings. Inverts the dark and light projection areas. 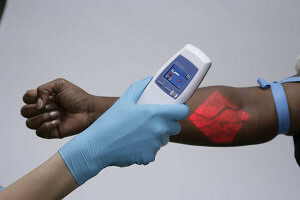 Changes the depth of vein detection. Improve visibility when the veins are very small. The inverse setting inverts the dark and light projection areas of the AV400. The inverse setting may improve vein visibility or you may simply prefer it. You may prefer normal or inverse based on the lighting conditions of where you are performing the procedure. The inverse setting is highly recommended in cases where the veins are very small. 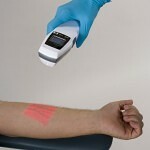 The Accuvein AV400 should be used to find veins ________. Without using the tourniquet . For IV starts, blood draws, or any other procedure where viewing the vasculature is beneficial. To increase venipuncture success rates which leads to more satisfied patients. On any patient where it would be beneficial to find valves, bifurcations. The AV400 projects a patient’s vasculature and is used in conjunction with standard procedural techniques and best practices. It can be used to locate veins for IV starts, blood draw, sclerotherapy, general and cosmetic surgery. You may want to locate veins to access them or avoid them depending on the procedure. The “wipe technique” involves occluding the vein, pushing the blood out of the vessel and watching it refill. This is done in order to ________. Identify and avoid valves and bifurcations. Determine structure of the vessel. The wipe technique is used to verify vein patency by occluding and wiping the vein; you can verify blood refill as well as the structure of the vessel. This helps you avoid valves and bifurcations during cannulation so that you can avoid damaging or “blowing” the vein. 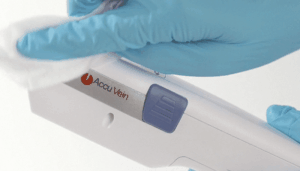 The Accuvein AV400 hands free accessory serves what purpose? Requires an additional person to help hold the AccuVein device. Allows you to access the vein without having the vein light on. Allows hands to be free to perform venipuncture. Warms up the device in preparation for use. 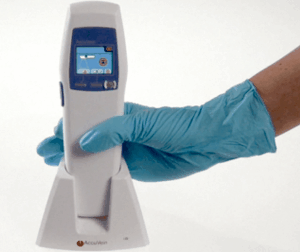 The AV400 is easily used as a handheld for quick assessment of the patient. Placing the device in a hands free accessory allows your hands to be free to perform procedures. A few hands-free accessories are available including a wheeled hands-free stand and a hands-free accessory that consists of a clamp and flexible arm that you can take to your desired location. When using the AV400 a protective eye shield should be used on ________. Patients with inhibited or reduced blink reflex. Patients who are under anesthesia or sedated. Patients with normal blink reflexes. 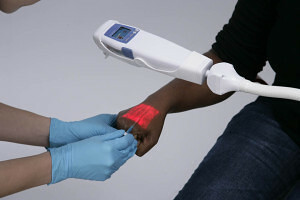 The vein display light should not be shined in patient’s eyes. Patients that have inhibited or impaired blink reflex such as neonates require additional care. This includes patients that are under anesthesia or sedation. In such cases where these conditions are present, any protective eye shield is recommended. An example are the eye shields used for neonates under a bili light. What do spots in the vein projection mean? The battery needs to be recharged. The vein viewing lens needs to be cleaned. The device should be turned off and on. Optical surfaces can be cleaned with a soft lens wipe with a few drops of isopropyl alcohol. Clean the body of the device with alcohol or hospital approved wipes such as Super Sani-Cloths (complete details can be found here. You can also clean the charging cradle and hands free accessory as necessary. The AV400 is made of medical grade plastic. Too much liquid or an over-saturated cloth can permanently damage the AV400. Bleach and CaviWipes1 should not be used on the AV400. 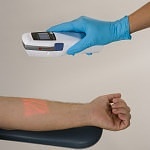 If you see spots on the projected site while viewing the veins on a patient, what should you do? Clean lens on the device with a slightly damp or pre moistened alcohol prep pad. Return the device to materials management. Wash device in the sink with running water. If there are spots on the lens you’ll be able to see them because a dark spot will move with the device while you are viewing veins. If you see spots on the projected site while viewing veins, you can clean the lens with a slightly damp or pre-moistened alcohol prep pad. Tip: Never submerge the unit or use a wet cloth. If the cloth is dripping, then it is too damp. Pre-moistened pads are just right. How much time do I have after the device has been fully charged to use it? Up to 3 hours of constant vein illumination. 30 minutes of constant vein illumination. 12 hours minutes of constant vein illumination. It needs to be kept on the charger while I am using it. When the device is not in use it is recommended that it be kept in its charging cradle so that it is kept charged and ready for use at any time. When in the charging cradle the battery charge icon will display. It typically takes 2-5 hours to fully charge the device and there is up to 3 hours of constant vein illumination time per charge, depending on how often you use it. so you always know where it is and its always charged.